The GeoTol Pro book is a professional grade, must have a companion for all personnel using geometric tolerancing. The book was released in mid-2009 and is recognized as the “Gold Standard” to interpreting geometric tolerancing. It is written to the latest ASME Y14.5-2009 standard on dimensioning and tolerancing. It has tables of symbols and an appendix that lists all the improvements and changes from the earlier ASME Y14.5M-1994 standard so it can be used to interpret the latest or earlier standards on geometric tolerancing. The book is complete and also has excerpts listing the similarities and differences from the international, ISO standards on dimensioning and tolerancing. The book has 380 pages with hundreds of graphics in full color. The color graphics make the drawings and tolerance zones “pop” off the page. The full color graphics makes the datum reference frame and tolerance zones stand out and concepts clear and easy to understand. The book is written in a simple easy to understand language. It has 17 units that begin with the basic fundamentals that gradually progress through the advanced concepts of tolerance boundaries and simple stack-up calculations. The book is designed for engineers, designers, manufacturing and quality personnel. It has hundreds of graphics that show parts in practical assemblies, the application on the drawing, along with graphical inspection techniques and data reporting procedures. The book comes complete loaded with student exercises during and at the end of each chapter. This allows the reader to periodically test their new found skills as they progress through the units. The book has a table of contents and index for an easy search for information. Special feature for instructors/leaders: The book can be used alone, as a reference, or as part of a complete training system on geometric tolerancing. To aid a instructor/leader in the presentation of the geometric tolerancing training materials there are a few options. A MS PowerPoint presentation is available with over 1700 full color animated computer graphics. There is also a 17 unit DVD video program in high Definition Blue Ray available. Also available is a set of wood and plastic models of miscellaneous parts an inspection equipment such as height gage, angle plate, sine bar, vee blocks etc. 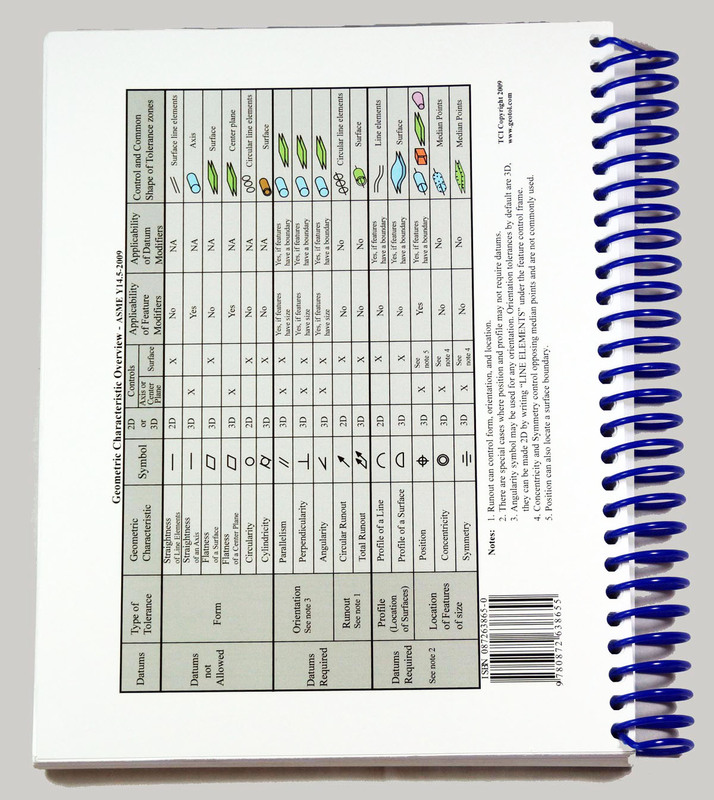 The pictures and page numbers in the workbook correspond to and match the wood/plastic model set, Instructor PowerPoint Kit and DVD/Video Series. The instructor/leader can use any or all of these materials to provide the students with an exciting/practical hands-on learning experience. The book is co-authored by Scott Neumann and Al Neumann. Scott Neumann is a mechanical engineer who specializes intolerance stack-ups and inspection techniques. Al Neumann has been a member of the ASME Y14.5 committee for the past 25 years and also serves on the ASME Y14.5.1 committee on mathematical principles of dimensioning and tolerancing. Both Al and Scott are active on the ISO standards committees and have authored best-selling books and video training programs on the subject of geometric tolerancing. They both travel presenting thousands of training programs to hundreds of thousands of people around the world. The book imparts Al and Scott’s knowledge working with thousands of people in hundreds of industries around the world. The GeoTol Pro book is $85 with a 10% discount to those who wish to upgrade their earlier book on geometric tolerancing.